I’m not sure exactly when I became a sausage snob. I suspect my days at school when no one seemed able to raise a dollar without rolling a thin brown snag across a just-warm barbeque contributed to my fussiness. I’ll eat most things, but I cannot understand how the lure of a beef sausage cooked to the consistency of petrified wood served upon a piece of dry bread. At University while my mates enjoyed what seemed a three year sausage fest, I resisted the sizzle. It wasn’t until Bearhands and I moved to the farm that snag pestering became persistent. Bearhands missed sausages and I came to realise that the occasional snag in the kitchen is a good thing. Our butcher at the time was a little too eager to encourage my love of sausage, but Mum later told me that was normal. There are two kinds of butchers: the flirty ones and the ones with their finger on the scale. Bearhands and I will have been married seven years this week and as the story of true love goes, he’s taught me how to embrace good sausage. I’d get bored pretty quickly if we had the same old snag every week, so I’m always trying new ways to spice things up. 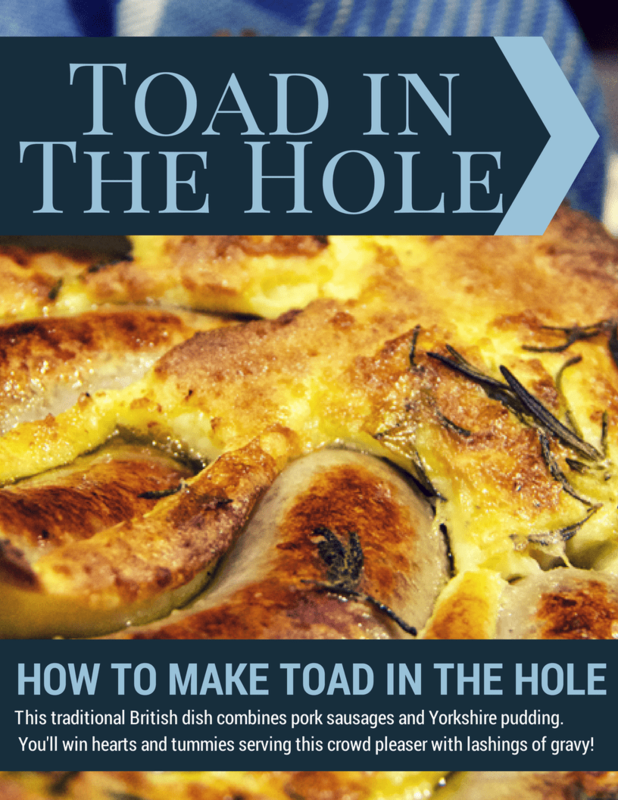 Toad in the hole is a traditional British dish that combines good pork sausages and Yorkshire pudding. It’s guaranteed to satisfy a husband with a banger hankering. sprigs of fresh rosemary – leaves removed from woody stems. Preheat oven to 220ºC (fan forced). To make the Yorkshire pudding batter, combine the flour, salt eggs and milk and whisk until smooth. Add the olive oil to a baking dish and heat in the oven for five minutes. Remove the tray from the oven and add the sausages and half the rosemary. Careful, the oil will spit! Return to the oven and cook until the sausages are golden. Remove from the oven and add the Yorkshire pudding batter. Top with the remaining rosemary and return to the oven and reduce the heat to 200ºC. Cook for thirty minutes. Don’t peek! It’s important not to open the door of the oven for the first twenty minutes or the pudding may not rise. do you love a good snag? is your butcher a flirt? Maybe it’s because we’re from the mother country, but we love a good Toad in the Hole and it makes a regular appearance on our winter menu. There’s something so delicious about a Yorkshire Pud especially when it’s giant sized and stuffed with snags! Nom! Hubby would love his – he’s a sausage man, sometimes. I’m not a fan either, can’t see the point of all those calories for something squashed in animal skin. My hubby loves a good sausage. Me not so much. But I do love yorkshire pud and this looks like it might just change my mind, Yum. There is something about a man wanting a fat sausage .. My husband of 9 years recently commented that he was craving thick sausages .. and then went on to mention that I have NEVER cooked him thick sausages. NEVER is a long time. My childhood experience of the thick sausage was burnt on the outside and raw in the middle therefore, just like TBone steak, rissoles and boiled mince … I don’t cook them. Anyhow, being the good wife hat I am I went and bought some ‘pre-war’ sausages from a notable butcher on the coast and they have gone down a treat … I just make sure I cook them slowly over a low heat. To top off the week of the sausage husband also got to have his fat sausages while in a mining camp .. he rang me especially after breakfast to tell me, must have been the highlight of his day.